Massaging is one of the most important processes in the preparation of processed meat products to optimize color and absorption of additives to produce ideal flavor and appearance. 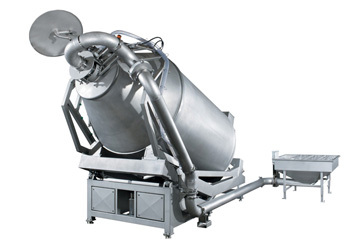 The tumbler massager has been designed to ensure efficiency, reliability, economy, and flexibility. The massage drum is intended for continuous operation with 95% vacuum. The massager consists of a pivoting frame with a hydraulically operated massage drum. Two swivel points on the frame provide a fixed pivoting connection to the frame of the unit that hold the hydraulics and vacuum pump. The design allows the massage drum to be raised or lowered even when the massager is filled. Optional lid design features one lid for vacuum loading and second lid for vacuum tumbling. 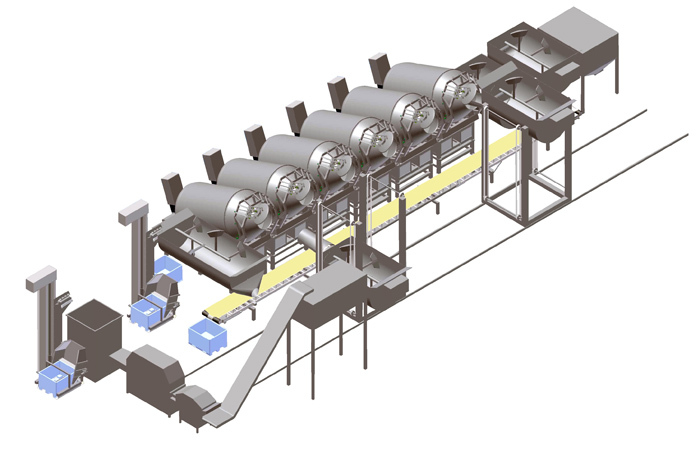 Automatic loading & discharge, fully automatic massaging operation from injection to maceration, with final discharge to conveyor.